Hello friends! 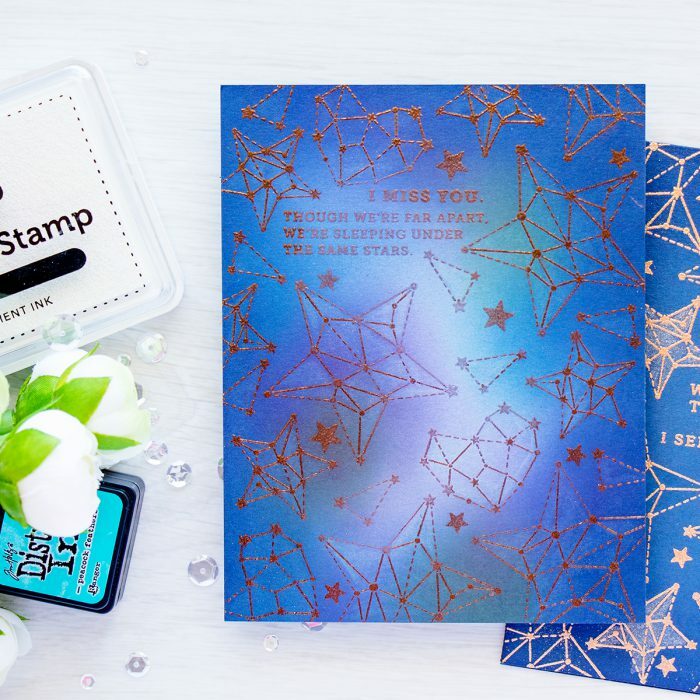 I have been playing with Simon’s Seeing Stars stamp set and stamping various backgrounds for my cards. As I was experimenting I came across an easier way to create a galaxy background and I’d like to share it in today’s blog post. I used two colors of embossing powder to create cards I’m sharing in this video – Gold and Rose Gold. Both are stunning, but the Rose Gold will pleasantly surprise you – it shines beautifully when the light hits it, this is especially noticeable with artificial light. Rose Gold embossing powder looks dull on the photo below, but be sure to check the rest of the photos and video too to see the shine. Like this project? Pin it and save for later! This is a one layer layer. I started working on this project by heat embossing the sentiments first. I went with “I Miss You. Though We’re Far Apart, We’re Sleeping Under The Same Stars”. 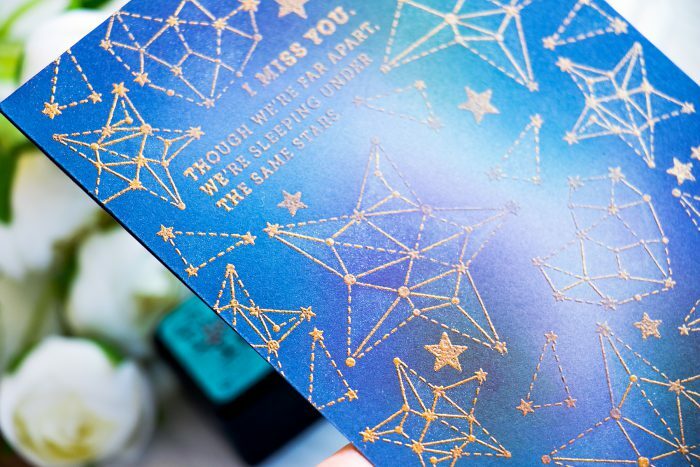 If you heat emboss other elements first and sentiment last, you run the risk of not having enough space on the card to fit it, so its best to start with the sentiment. 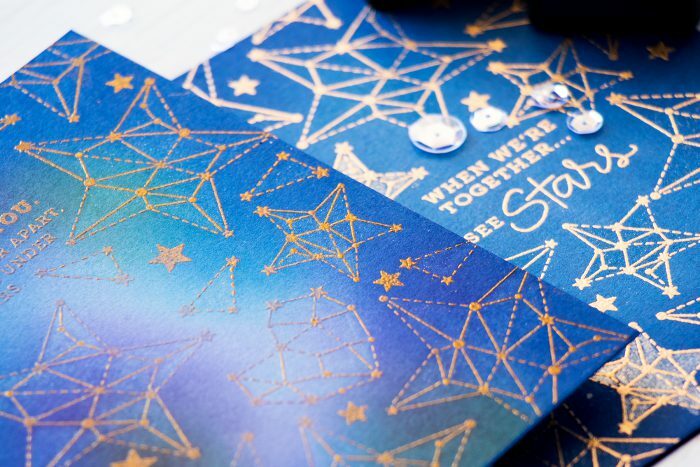 I also used images of star constellations and embossed them on the background around thee sentiment. 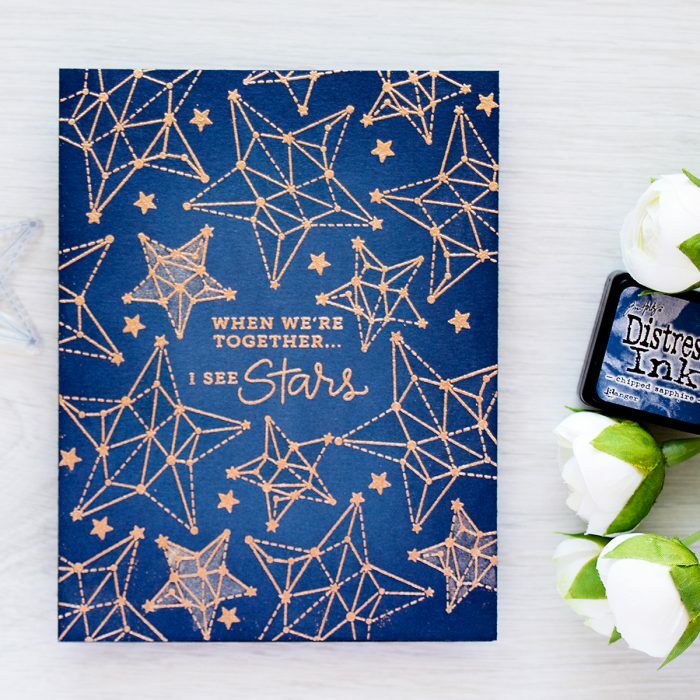 The little gaps were filled with little solid stars, that also came from the Seeing Stars stamp set. Instead of starting this card on a white piece of cardstock like I always do, I started on Simon’s Soft Navy card. This gave a nice blue background for my project. Having a colored background makes it much easier to add additional color as there’s a lot less ink blended needed. First I blended white pigment ink over the central portion my heat embossed card front. White ink created a placeholder for other colors and also an illusion that this piece was white to begin with. Next I used Distress inks and added additional colors. I went with the same colors of ink I always use when I go to create a galaxy – Seedless Preserves, Peacock Feathers, Wild Honey. This time I also blended a bit of Chipped Sapphire around the edges to darken them. Lastly I used my Wink Of Stella glitter pen and added a bit of glitter to some of the larger stars. 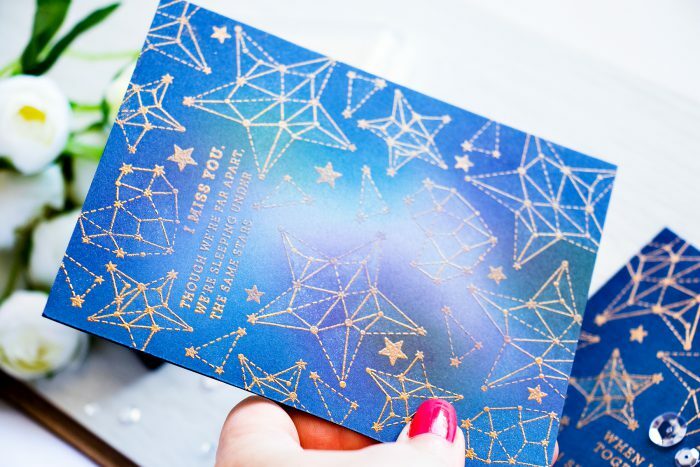 I also have one more card to share using this stamp set, but this one was done without any ink blending, stars were heat embossed onto same Soft Navy cardstock, but using Gold embossing powder this time. Chipped Sapphire ink was blended around the edges to darken them and make the center look lighter. This is a stunning card. And love the detailed video. Thanks for sharing! These backgrounds are awesome! You’re really mastering galaxy theme!